Community Blog - Ain't Snow Green... Don't Polar Bear's Live in the Arctic? Ain't Snow Green... Don't Polar Bear's Live in the Arctic? I was thinking when I returned from my one venture (to get chocolate supplies for the snow in) into the blizzard of white that was yesterday - how green is snow? When I say green, I really mean eco-friendly. Here's the thing... I live on a very busy road and I have a A106 fly-over virtually in my backyard. Needless to say it's a pretty noisy place to live with all that traffic bumbling about outside the lounge room. 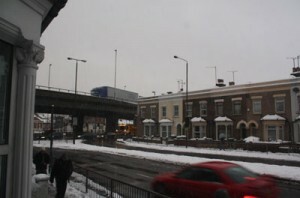 But when the snow blew in on Sunday afternoon... well... the motor grumbling buzz of cars, buses and motorbikes softened. Partly because there was less traffic on the road, partly because the snow absorbed some of the vibrational noise. The less people on the roads - the less CO2 released into the atmosphere. So the way I see it snow's kind of green. I wonder if that polar bear they found floating in the Thames last week is feeling at home in this icy weather. In case you missed it - the global warming art was created to launch the new natural history based TV channel Eden TV. The 16 foot high sculpture, which took fifteen artists two months to make, floated all the way from Greenwich to Tower Bridge in the hope it would raise awareness on the plight of the endangered bear and it's dwindling habitat due to climate change. Let's hope the snow and the polar bears save our earth climatic catastrophe.